Can’t stand to stop watching Surprised Kitty long enough to microwave your ham and cheese Hot Pocket? Don’t be ashamed – we know just how you feel. 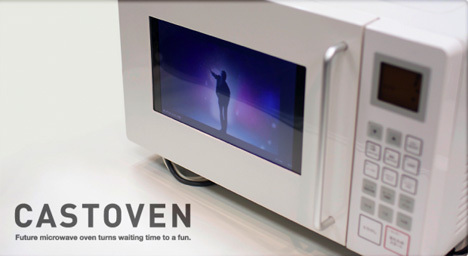 Luckily, two researchers from Keio University in Japan have invented the answer for hungry uber-geeks everywhere: a microwave that plays YouTube videos on a 10.4-inch screen in its door. 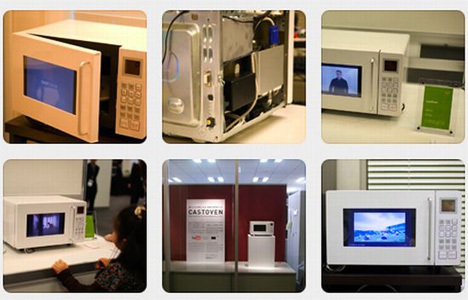 The Castoven chooses appropriate-length videos based on the amount of time your food needs to cook. Operating on a Mac system, the microwave uses a special Adobe AIR app to pull the videos from YouTube. The basic idea behind the product is to integrate common household electronics items with components of the Internet to make everyone’s lives better and happier. And happier we all will be once our kitchen appliances are smart enough to know that cooking is boring and we need to be entertained, even if it’s only for two minutes. It’s not for sale just yet, but there are already refrigerators with TVs in them so it’s not hard to imagine that this will be available sometime in the not-so-distant future. See more in Home & Personal or under Gadgets. December, 2009.